Have you ever wanted to learn graphic design using something better than MS Paint? Edit movies by going above and beyond iMovie or Movie Maker? Or create documents for print like newspapers, brochures, or posters like the one above in an application more powerful than Microsoft Word or Publisher? 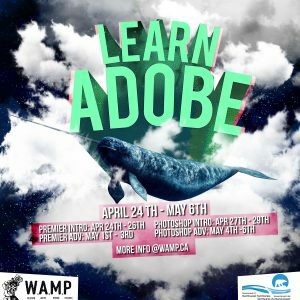 Come to one (or all) of our workshops and learn (more) about how to use Photoshop, Premiere Pro. Whether you are a complete beginner or already have experience using these tools, we encourage you to come out and have instructor Davis Heslep deposit some knowledge and skills into your creative brains! The price of each two day workshop is $200. Each day, workshops will run from 6pm – 10pm with breaks. There is limited space, so be sure to act quickly and register!